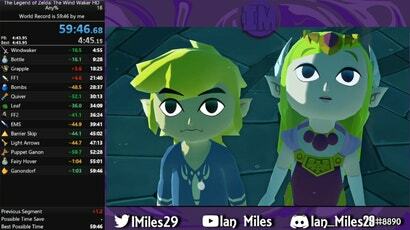 Most players will take days to complete The Legend of Zelda: The Wind Waker, but speedrunners do it much faster. Thanks to a year full of new discoveries and attempts by hard-working runners, The Wind Waker HD has been completed, for the first time ever, in under an hour. The new Any% world record — a speedrun aiming to beat the game as fast as possible by whatever means — was completed by ian_miles29. Early last year, The Wind Waker HD used to take up to three hours to run. The latest world record clocks in at 59 minutes and 46 seconds. 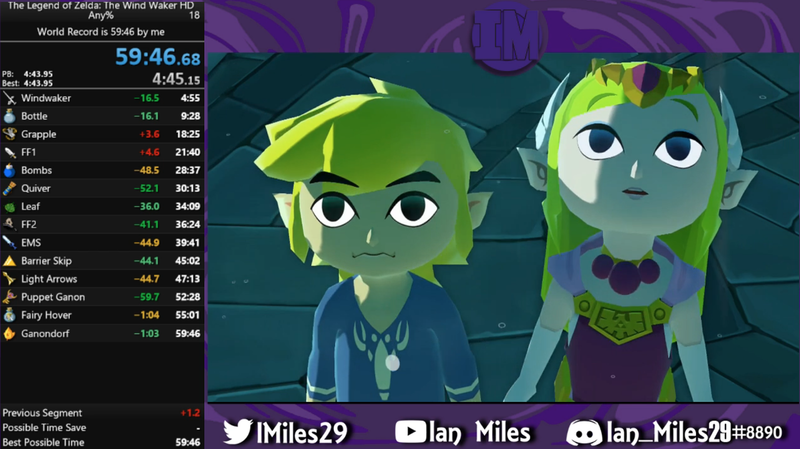 The Wind Waker HD speedruns have seen drastic changes over the last year, as new glitches allow major portions of the game to be skipped. One of the largest finds came in April 2017 when runners found a setup to perform the “Barrier Skip”. It was the Holy Grail of Wind Waker tricks, allowing earlier access to the endgame; a version of the trick was found to be possible only in The Wind Waker HD. This led to new complications as runners worked to find a way to reliably “zombie hover” out of the Puppet Ganon boss fight room. Ian_miles’ run uses these tricks but saves extra time with two other techniques. The first is the “Door Clip”, which has been known to the community for some time. It’s a difficult trick used to pass into a locked door in the Forsaken Fortress. Usually, players open the door by using the Skull Hammer on a nearby switch. However, it’s possible to clip through the door using another trick called a “Item Slide”. Item Slides allow Link to gain massive bursts of speed, enough to break through geometry. A new set-up for sliding through the locked door allows ian_miles to access a later game boss fight earlier. This still isn’t easy. To complete a Door Clip, runners need to build enough speed to break through the door. Ian_miles uses a metronome in order to keep track of his speed and time the trick more accurately. Ian_miles also saves time skipping a cutscene with the Deku Tree. The Wind Waker HD handles Link’s health in strange ways. It depletes in quarter heart segments, and even if you’ve taken enough damage to reach zero hearts, there are moments, such as when your lifebar is still draining, when you still technically have some quarter hearts left. By attacking a bomb at a specific interval, runners can trigger the initial cutscene with the Deku Tree — which still loads because Link has a quarter of a heart — before skipping the cutscene where Link’s heart count reaches zero. This skips the cutscene and saves about 40 seconds. Ian_miles enters the final boss fight against Ganon at 58:59. He had around one minute to defeat the boss if he wanted a time under an hour. Thankfully, he nails it. This run improves upon ian_miles’ previous world record, clocking in just over a minute faster. It’s both a great example of skillful execution and a chance to see how much a run can change as an active community picks a game apart.